On Wednesday, April 4 at 7:30 p.m., American Music Theatre will have the honor of hosting the Lancaster Symphony Orchestra as they present the U.S. premiere of Disney’s Fantasia, live in concert. 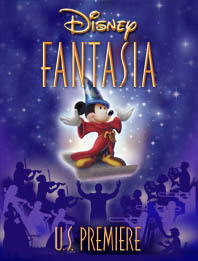 Disney shares one of its crown jewels of feature animation by showcasing selections from Walt Disney’s original Fantasia and Disney’s Fantasia 2000.The film will appear on a large HD screen above the stage during the live LSO performance of music by Beethoven, Tchaikovsky, Debussy, Respighi, Rimsky-Korsakov, Stravinsky, Gershwin and others. “This latest version is an amalgam of the original and a 2000 reissue, with some previously edited clips restored,” LSO Music Director Stephen Gunzenhauser told Ms. Green for her article. “The film’s scores, recorded by the respective Philadelphia and Chicago orchestras, will be replaced by LSO’s live music, with narration expected to be supplied by the local maestro,” she wrote. To read Ms. Green’s article in its entirety, click here. Another interesting area connection is Lancaster-based graphic designer Michael Abel, who created the artwork for the show’s programs. His design, seen above, will be used on Fantasia concert programs throughout the U.S.
Wednesday, April 4 at 7:30 p.m.